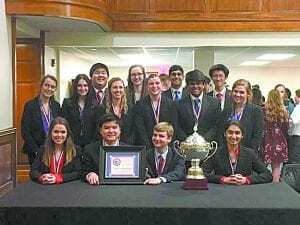 The We the People team at Vestavia Hills High School recently won first place in a state championship at Samford University’s Cumberland School of Law. Teams were tested on their knowledge of the U.S. Constitution and Bill of Rights, giving presentations and answering questions from judges to showcase their depth of understanding of their presented topic. This is the second consecutive state title the team has earned, and it puts the team on track to compete at the national competition to be held later in the spring. Team members included Sam Swinson, Abby Ronson, Julia Holmes, Julia Stewart, Ellis Zhang, Walter Zhang, Boris Lu, Ritika Samant, Caroline Bass, Nikki Pedicord, Rohith Vuribindi, Sophie Borden, Rizwan Khan and Libby Jackson.